You are here: Home / EcoKids-Environment / Peace, One Day. September 21. Reach And Teach. Show them the wings of hope with peace doves soaring high, conveying that the power of youth is global. (My hero, JGI’s Roots & Shoots) Look how much fun the Sprouts of Hope kids had creating their giant dove creations! Think about the violence in your own personal world…whether it’s shrieking at a family member, body snarking and bullying (including yourself!) relentlessly teasing a sibling or peer…Dial down your own drama and give teens helpful media tools to diminish theirs! Light a candle and create your own ritual to take a vow of one solid day in your OWN house free of conflict and totally at peace. Larger actions? Save lives right here, right now by taking action at sites like Peace One Day. Download free educational classroom materials for peace. Send out a care package to kids in high conflict zones. Help with medical supply distribution to remote kids using innovative ideas like ColaLife.org! Create an ‘attitude of gratitude’ with pushpins on a world map where children are less fortunate; give voice to their stories. Make teens aware of dating violence (1 in 3?!) and social media sites that can help. Promote ‘one world’ thinking with a 2020 global view by scattering Earthseeds for peace. Watch this :30 video below and think about things in YOUR own world you could ‘rewind’ to impart a more peaceful solution. More thoughts? What will YOU do to bring peace to the planet today? “To some it’s just a single day. But to us, 21 September is a 24 hour-long platform for life-saving activities around the world and an opportunity for individuals – particularly young people – to become involved in the peace process. 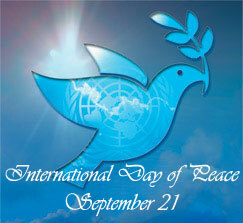 21 September is the UN International Day of Peace, a day of global ceasefire and non-violence: Peace Day. By 2007, the UN estimated that over 100 million people from all walks of life actively supported Peace Day around the world. That same year, Peace One Day was instrumental in securing the conditions by which mass polio vaccinations could be carried out in Afghanistan on Peace Day; 1.4 million children were vaccinated in some of the most remote areas of the country. And in 2008, an additional 1.6 million were treated. That’s an estimated 3 million children in Afghanistan alone – on Peace Day. Watch them and then use the site to commit to taking action on Peace Day yourself. Right here. Right now. I will. Will you? You makes such an important connection between that oh-so-fuzzy path to ‘world peace’ and the more tangible individual path to peace, within oneself, with family, with friends, and with community. So often those of us who support nonviolent political intervention engage in violent emotional intervention with our friends and loved ones. But it’s often so much easier said than done. I’m truly lucky to be involved with a nonprofit that works for that kind of individual peace, particularly with young people: Project Happiness (www.projecthappiness.com). Contact us any time for help with creating and maintaining an ever-elusive inner peace! Thanks, Abby, I LOVE ProjectHappiness and have been wanting to do a post on it for ages, but keep getting deluged with ‘time sensitive’ (date driven) topics pushing it to the back burner! Let’s connect w/Randy Taran et al and make it happen!